Portable unit for AdBlue® DEF transfer, fitted with battery pump, 12 V or 24 V, suction and delivery hoses, filter and fuel nozzle. Thanks to its small size, reliability and ready-to-use configuration, it is especially useful when fuel must be transferred or dispensed safely having only battery power on hand. Tipical fields of application are agriculture and transport. Power supply: 12 V DC or 24 V DC. Consumption: 22 Amp (12 V DC) - 11 Amp (24 V DC). Max flow rate: 40 L/min. Suction height: up to 1,5 meters. Working temperature: -20°C / +60°C. Self-priming volumetric diaphragm vane pump, with by-pass valve. Terminal board for switches and circuit-breakers. Battery cable, 4 m length, complete with clamps for battery connection. EPDM hose, 3 m length, size 3/4”, suitable for Ad-Blue® DEF. Suction fuel hose, 3 m length, size 3/4”, suitable for AdBlue® DEF. 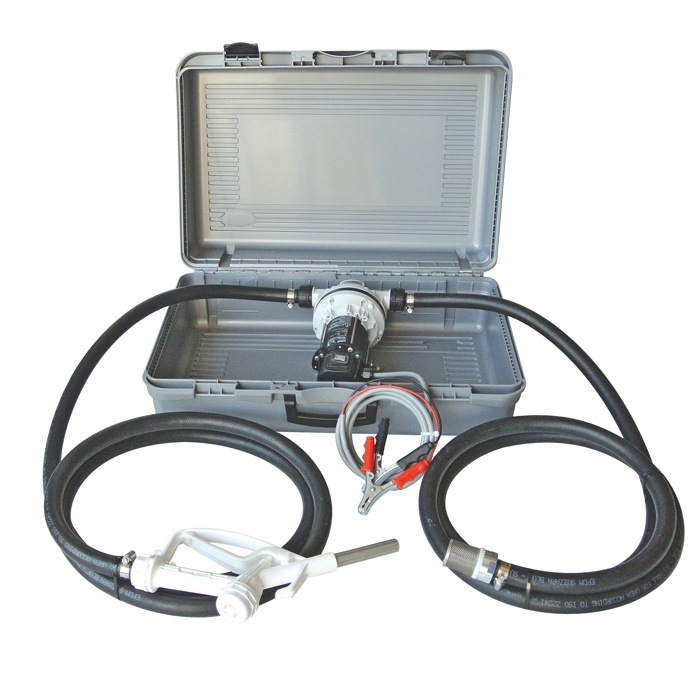 Manual nozzle for AdBlue® DEF.